City Plaza Espresso Cafe, Whyalla's Newest Licensed Alfresco Restaurant opened on 5th of October 2005...and our web site was also launched...You will find the latest specials or events here so keep your eyes open! 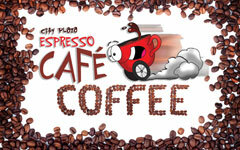 NEW products @ Espresso Café are Chocolate Decadence and Toffee coffee , delicious drinks you need to taste today! We also have a large variety of whole delicious cakes for special occasions to order. New and exciting flavoured drinks now available - flavoured Iced chocolates to tantalise your tase buds and delicous flavoured coffee and hot chocolate to warm you up. Get your coffee card today from the counter & be rewarded!